How to survive in Australia, or why I survive there! Today I will share with you a secret. What could that be, you might ask? Well, there is not only good wine in Australia but also excellent beer. Beer what is the man talking about? My lovely brother in law, Michael, surprised me again this year by filling (literally speaking) my fridge up with bottles of my favourite German beer: Bitburger Pils. So whenever I needed to cleanse my pallate or felt homesick for my native land, the Mosel. 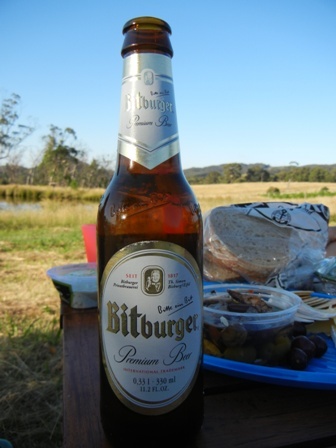 I could open a bottle of Bitburger Pils and forget all the sorrow and be happy. The good news is, there is good beer in Ozz. This entry was posted on Thursday, January 26th, 2012 at 8:35 pm and is filed under culture. You can follow any responses to this entry through the RSS 2.0 feed. You can leave a response, or trackback from your own site.